Original pom pom design and Kawaii fashion! to continue to shop with Frilly Pops! PRE-ORDER NEW Duvet Dango Thick Jumper sweater sweatshirt, kawaii, harajuku style, japanese, cute! I get endless compliments on these earrings! I absolutely love them! NEW COLOURS! Here's a handy guide so you can customise your own set of PL1 and PL2 enamel pins! 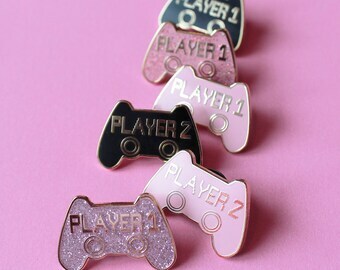 New opposite colourway Player 1 and Player 2 Pins!! New diary journal sticker sheet!!! My shop, set up on a wim really, but now has become a driving force in starting up my own brand and animation business ! I bring you, pom pom jewellery, kawaii clothes and other fashion accessories inspired by Japanese culture, video games, disney and cuteness! I'm always up for custom orders or ideas, so fling them my way! Please follow me on instagram and like me on Facebook for exclusive competitions, coupons and offers and details on what markets and events I will be attending. Welcome to Frilly Pops, home of Pom Pom creations! I'm Stephanie, I run Frilly Pops and hand make all of the items in my shop! Most of my products are made to order, so if you have any questions or ideas, please feel free to message me. Refunds can not be given if you do not like the item because it isn't the size you were expecting or doesn't fit correctly. All of the sizes are clearly labeled on each listing and I do my best to capture the correct colours. Refunds will not be given if you misread the item details. Please be aware: Earrings are a non-refundable/ non-returnable product due to sanitary reasons. This is in accordance with Distance Selling Regulations. If your item is lost in transit: I will send a replacement only. If your item arrives damaged in transit: photos of the damage will be required and then a replacement can be re-shipped. You may cancel your order within 24 hours of first purchase ONLY! I try to dispatch within 2 days, so let me know asap to avoid any disappointment a small transaction fee can not be refunded. Once item is declared dispatched you may not cancel or change the order. Your order will be dispatched within 6 working days. Excluding pre-orders. Although these are estimates the Royal Mail aim to meet, some packages arrive slower. If your'e package doesn't arrive in a timely manner please be aware that I can not track your package if you didn't ask for your package to be tracked. The Royal Mail deems your parcel lost if 25 working days have past, so please allow for this. If you have any concerns please do message me in a polite manner. If you are ordering fluffy earrings, please be aware, that boarder customs tend to stop these parcels as they are marked as a 'natural' product. Please be patient. If you wish to enquire about a custom order, please feel free to message me, I'll do my best to accommodate you.